The University of Southern California (USC[a]) is a private, not-for-profit, nonsectarian, research university founded in 1880 with its main campus in the city area of Los Angeles, California. As California's oldest private research university, USC has historically educated a large number of the region's business leaders and professionals. In recent decades, the university has also leveraged its location in Los Angeles to establish relationships with research and cultural institutions throughout Asia and the Pacific Rim. In 2011, USC was named among the Top 10 Dream Colleges in the nation. 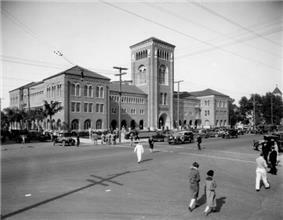 The University of Southern California was founded following the efforts of Judge Robert M. Widney, who helped secure donations from several figures in early Los Angeles history: a Protestant nurseryman, Ozro Childs, an Irish Catholic former-Governor, John Gately Downey, and a German Jewish banker, Isaias W. Hellman. The three donated 308 lots of land to establish the campus and provided the necessary seed money for the construction of the first buildings. Originally operated in affiliation with the Methodist Church, the school mandated from the start that "no student would be denied admission because of race." The university is no longer affiliated with any church, having severed formal ties in 1952. ^ As of September 14, 2014. "USC Passes Halfway Mark in $6 Billion Fundraising Drive" (HTML). Bloomberg. Retrieved October 13, 2014. ^ a b "Faculty and Staff (2009–10 academic year)". USC. Retrieved 2010-06-22. ^ a b c d e "USC Student Enrollment Statistics 2012-2013 Academic Year". USC. Retrieved 2014-04-18. ^ "Graphic Identity Program". University of Southern California. Retrieved 2008-01-31. ^ USC at a Glance - USC Graduate Admission. Usc.edu. Retrieved on 2013-08-21. ^ Wienerbronner, Danielle (2011-03-24). "College Applicants' Top 10 Dream Colleges: Princeton Review List". Huffingtonpost.com. Retrieved 2013-05-31. ^ "USC Facts and Figures". USC. Retrieved 2012-10-04. ^ "NATIONAL COLLEGIATE / DIVISION I TOTAL CHAMPIONSHIPS". Retrieved 2010-08-27. ^ a b "USC Olympians: 1904 to 2012". USC. Retrieved 4 October 2012. ^ "Alfred S. Harrison". United States Army Corps of Engineers. 2011. Retrieved September 29, 2011. ^ George, Evan (December 11, 2006). "Trojan Dollars: Study Finds USC Worth $4 Billion Annually to L.A. County". Los Angeles Downtown News. ^ Garcia, Chantal (September 15, 2004). "VKC: A president's legacy". Daily Trojan. ^ "About USC – Administration". USC. Retrieved 2007-05-08. ^ "The John McKay Center". Retrieved 2012-04-25. 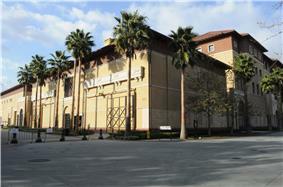 ^ "USC to break ground on John McKay Center". Retrieved 2012-04-25. ^ "The Annenberg Building at USC". Retrieved 2012-04-25. ^ "The Village at USC: The Largest Private Investment in the History of South Los Angeles". Retrieved 2012-04-25. ^ "USC University Park Master Plan". usc.edu. Retrieved 2011-01-10. ^ "The Verna and Peter Dauterive Hall - New Social Sciences Building". Retrieved 2012-04-25. ^ ":: Expo Train ::". Buildexpo.org. 2010-02-04. Retrieved 2010-05-23. ^ "DASH Routes". Ladottransit.com. Retrieved 2010-05-23. ^ de Vise, Daniel (2010-11-15). "Million-dollar college presidents on the rise". Washingtonpost.com. Retrieved 2013-05-31. ^ "USC Annual Security Report 2014". Capsnet.usc.edu. ^ a b "All Enrolled Students, by Class Level" (PDF). University of Southern California. 2007. Retrieved 2008-06-13. ^ a b c d e "USC Catalogue: About USC". University of Southern California. Retrieved 2008-09-18. ^ "AAU Members by Admissions". Association of American Universities. Retrieved 2008-06-13. ^ "USC Academics: Schools". University of Southern California. Retrieved 2008-06-12. ^ "USC the Graduate School: Degrees Awarded". University of Southern California. Retrieved 2008-06-13. ^ Waxman, Sharon (January 31, 2006). "At U.S.C., a Practical Emphasis in Film". ^ Van Ness, Elizabeth (March 6, 2005). "Is a Cinema Studies Degree the New M.B.A.?". ^ "School Overview". USC Annenberg. Retrieved 2007-04-26. ^ "Cowan honored with endowed faculty chair". ^ "US-China Institute :: news & features :: assignment: china - usci series on american reporting on china". China.usc.edu. 2012-01-31. Retrieved 2013-05-31. ^ "ONE National Gay & Lesbian Archives Research Collection Finds Permanent Home at the University of Southern California Libraries". Press Release. ONE National Gay & Lesbian Archives. Retrieved 8 July 2011. ^ "USC Libraries :: Specialized Research Collections". Usc.edu. Retrieved 2010-05-23. ^ "U.S. News Rankings Through the Years". Web.archive.org. 2007-09-08. Archived from the original on 2007-09-08. Retrieved 2013-05-31. 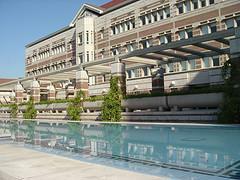 ^ "300 Best World Universities 2010". ChaseCareer Network. ^ "The Top American Research Universities: 2009 Annual Report" (PDF). 2009. Retrieved 2009-06-04. ^ "Top Law Schools". U.S. News & World Report. 2008. Retrieved 2008-06-13. ^ "Top Journalism Schools". U.S.A Today. 2014. Retrieved 2014-11-23. ^ "Top Business Schools". U.S. News & World Report. 2007. Retrieved 2008-06-13. ^ "Best Undergraduate Business Programs". U.S. News & World Report. 2009. Retrieved 2008-06-13. ^ "Top Medical Schools". U.S. News & World Report. 2007. Retrieved 2008-06-13. ^ "Top Engineering Schools". U.S. News & World Report. 2009. Retrieved 2009-04-25. ^ "Top Education Schools". U.S. News & World Report. 2011. Retrieved 2008-06-13. ^ "Best Graduate Schools, Fine Arts". US News & World Report. 2008. Retrieved 2008-06-13. ^ "Top Public Affairs". 2008. Retrieved 2008-06-13. ^ "Best Graduate Schools, Occupational Therapy". US News & World Report. 2014. Retrieved 2014-10-02. ^ "Best Graduate Schools, Physical Therapy". US News & World Report. 2014. Retrieved 2014-10-02. ^ "Overall Rankings". The Philosophical Gourmet Report. Retrieved September 13, 2011. ^ "Time/Princeton Review College Guide gives top honor to USC's "service-learning" model". TIME Magazine & Princeton Review College Guide. Winter 1999. ^ "2007 Academic Ranking of World Universities by Broad Subject Fields". Retrieved 2008-06-13. ^ "Facts and Figures | About USC". About.usc.edu. 2012-06-30. Retrieved 2014-08-15. ^ "USA QuickFacts from the US Census Bureau". Quickfacts.census.gov. Retrieved 2014-08-15. ^ "New First-Time Freshmen, by Home Location" (PDF). University of Southern California. Retrieved 2008-06-13. ^ "Top 25 Institutions Hosting International Students 2006–2007". Institute of International Education. Retrieved 2008-06-13. ^ "USC at a Glance: USC Student Characteristics" (PDF). USC. 2007. Retrieved 2007-04-26. ^ "Freshman Profile and Admission Information 2011-2012" (PDF). Retrieved 2012-05-18. ^ "Freshmen Profile and Admission Information 2011–2012" (PDF). Retrieved 2012-05-18. ^ "2006–2007 Annual report" (PDF). National Merit Scholarship Corporation. Retrieved 2008-06-13. ^ USC Self-Guided Tour, University of Southern California. Retrieved June 8, 2009. ^ "Residencies: General Information". University of Southern California. Retrieved 2008-06-16. ^ a b c "Faculty Distinctions: National Academy Members". University of Southern California. Retrieved 2008-06-13. ^ a b c d "Faculty Distinctions: Other Academies". University of Southern California. Retrieved 2008-06-12. ^ "Highly Cited Faculty From USC". Retrieved 2011-01-12. ^ "ACM Fellows Award/Leonard M. Adleman". Association for Computing Machinery. 2002. Retrieved 2008-03-19. ^ a b "Distribution of Awards From Funding Sources to USC Academic Revenue Centers – FY2007". 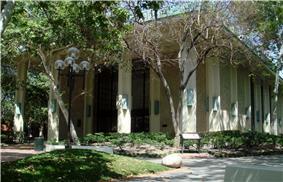 Department of Contracts and Grants, University of Southern California. Retrieved 2008-06-13. ^ "USC Faculty Portal – Research: Highlighted Research Centers". University of Southern California. Retrieved 2008-06-13. ^ "The History of ISI". Information Sciences Institute (USC). Retrieved 2008-04-08. ^ Sutliff, Usha (May 14, 2004). "Trojans for Life". USC News. ^ Daniels, Tom (August 23, 2003). "Salute to Troy". Scout.com. ^ "USC Olympicans 1904–2004" (PDF). Retrieved 2008-09-18. ^ "University of Southern California Official Athletic Site - Traditions". Usctrojans.com. Retrieved 2013-05-31. ^ Pedro Moura, Trojans take lead in all-time draft picks, April 30, 2011, accessed May 1, 2011. ^ Menghani, Rajan (December 1, 2005). "Pranks of the past, present". The Daily Bruin. 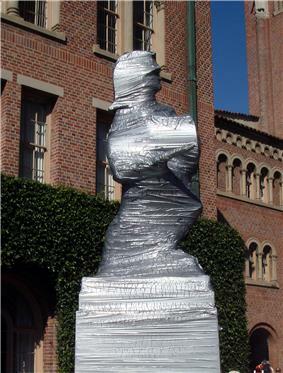 ^ "UCLA-USC rivalry week claims casualty as The Bruin statue is splattered in cardinal and gold paint [Updated]". Los Angeles Times. 2009-11-25. Retrieved 2010-05-02. ^ Christensen, Ashley (2004-08-18). "Not your average marching band". Daily Trojan. ^ "USC Marching Band on America's Funniest Home Videos". YouTube.com. Retrieved 2014-08-20. 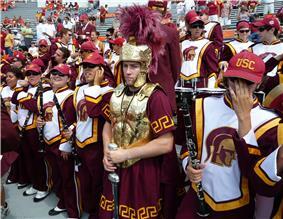 ^ Ashley Christensen, Not your average marching band, Daily Trojan, August 18, 2004. ^ Press Pack – Spring 2009, TMB SpiritNotes, Accessed May 11, 2009. 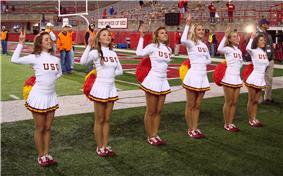 ^ "About the USC Song Girls". University of Southern California. ^ "Frequently Asked Questions: USC Song Leaders". University of Southern California. ^ Fuller, Ken (October 1, 1999). "Call of the Wild". Daily Trojan. ^ Huh, J. Christina (August 16, 2006). "Yell Leaders traded for Team Trojan". Daily Trojan. ^ Hill, Katie (March 29, 2007). "El Rodeo yearbook fears for its future after cuts". Daily Trojan'. ^ "USC in film: Feature Films", USC Campus Filming Office (accessed 2013-01-06). ^ "USC in film: Television", USC Campus Filming Office (accessed 2013-01-06). ^ "Midnight Club: Los Angeles South Central". Rockstar Games. Retrieved 2009-05-28. ^ "Dems take Bush to task over proposed amendment", CNN, February 27, 2004.
a. ^ The alternate name "Southern Cal" frequently appears in sports-related news articles. USC discourages use of "Southern Cal" out of concern the name might suggest a foundational association to the University of California, Berkeley (commonly known as "Cal" in the athletics context), even though the two institutions have no affiliation other than their Pac-12 membership. For several years, USC's media guides contained the following request: "Note to the media: In editorial references to athletic teams of the University of Southern California, the following are preferred: USC, Southern California, So. California, Troy and Trojans for men's or women's teams, and Women of Troy for women's teams. PLEASE do not use Southern Cal (it's like calling San Francisco 'Frisco' or North Carolina 'North Car.'). The usage of 'Southern Cal' on licensed apparel and merchandise is limited in scope and necessary to protect federal trademark rights." The campus has also served as a backdrop for television game shows Jeopardy! and Wheel of Fortune. Other television series that have been filmed on campus include a 2004 Democratic Party presidential candidates' debate, Hardball with Chris Matthews, The Scholar, The Best Damn Sports Show Period, and College GameDay. Movies filmed at USC include Forrest Gump, Legally Blonde, Road Trip, The Girl Next Door, Harold & Kumar Go to White Castle, Love & Basketball, Blue Chips, Ghostbusters, Live Free or Die Hard, House Party 2, The Number 23, The Social Network and The Graduate. Television series that have used the USC campus include Cold Case, Entourage, 24, The O.C., Beverly Hills, 90210, Moesha, Saved by the Bell: The College Years, The Fresh Prince of Bel-Air, House M.D., CSI: NY, Undeclared, The West Wing, Alias, The Office, Monk, The United States of Tara, Gilmore Girls, Scrubs, and The Roommate. The USC campus also appears on the video game Midnight Club: Los Angeles on its "South Central Map Expansion". Because of USC's proximity to Hollywood, close ties between the School of Cinematic Arts and entertainment industry, and the architecture on campus, the university has been used in numerous movies, television series, commercials, and music videos. 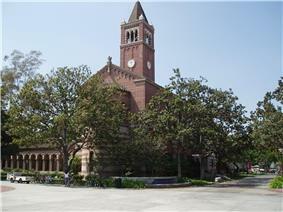 USC is frequently used by filmmakers, standing in for numerous other universities. Outside of the Panhellenic and Interfraternity conferences, the Greek community at USC is very diverse, boasting the Multicultural, Asian, Inter-Fraternity (composed of professional fraternities), and the National Pan-Hellenic (historically black) Councils. Organizations governed by these councils include chapters of some of the oldest Latino and Black Greek organizations in the country and the oldest Asian fraternity in Southern California; while also including established professional business, engineering, and pre-law fraternities and other multiculturally based groups. The Greek Community, making up approximately a fifth of the student body, has had a long and influential history on the campus. Centered on a portion of West 28th Street known as "The Row", located between Figueroa Street and Hoover Street just north of campus, USC's Greek system began soon after the school's founding when Kappa Alpha Theta founded a chapter in 1887. Founded in 1967, the USC Song Girls appear at all football, basketball, and volleyball games as well as rallies, university and alumni functions. Unlike other college cheer teams, Song Girls are primarily a dance squad and do not perform gymnastics, stunts or lead cheers. Founded in 1919, the USC Yell Leaders worked closely with The Spirit of Troy (USC Band) and the Song Girls to lead cheers and perform stunts to rally Trojan fans at football, basketball, and volleyball games. The sweater-clad team consisted of all men for most of its existence, though the squad later opened itself up to applicants from both sexes and did feature one female Yell Leader in 1998. They were disbanded by the University after the 2005–06 season and replaced by the co-ed Spirit Leaders. The band performed on the title track of the 1979 Fleetwood Mac album Tusk, which went on to be a multi-platinum record. The band performed during halftime at Super Bowl XXI in 1987 and Super Bowl XXII in 1988. In 1990, the band performed live on America's Funniest Home Videos. Additionally, the band later played on another multi-platinum Fleetwood Mac album, The Dance (1997). The Spirit of Troy is the only collegiate band to have two platinum records. In recent years, the band has appeared at the 2009 Grammy Awards, accompanying Radiohead; on the 2009 Academy Awards with Beyoncé Knowles and Hugh Jackman; and during the finale of American Idol 2008, backing Renaldo Lapuz in instrumentation of his original song "We're Brothers Forever." In 2009, the band played on the show Dancing with the Stars. In the 1940s, George Tirebiter, a car-chasing dog, was the most popular unofficial mascot. After it bit the mascot of the UCLA Bruins, it gained fame among students. The dog was known to chase down cars on Trousdale Parkway, which runs through campus. After the original dog died, a few others succeeded it. A statue was built in 2006 to honor the unofficial mascot. Traveler, a white Andalusian horse, is currently the university's official mascot. It first appeared at a football game in 1961, and was known as Traveler I. The current horse is known as Traveler VII. In addition, USC has rivalries with other Pac-12 schools, particularly the Stanford Cardinal as they are the only two private universities in the Pacific-12 Conference and are situated at opposing regions of California, as well as being the two oldest private research universities in California, 1880 and 1891 respectively. Recently, a rivalry has begun to exist between USC and the University of Oregon because of the two universities' dominant football programs, with each school often serving as the toughest match-up on the opponent's schedule. 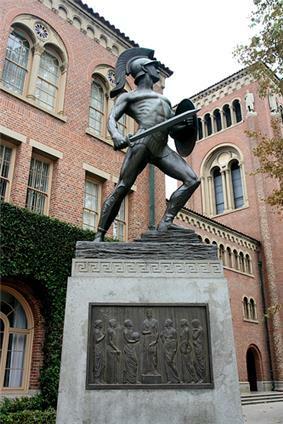 USC's cross-town rival is UCLA, with whom there is fierce athletic and scholastic competition. 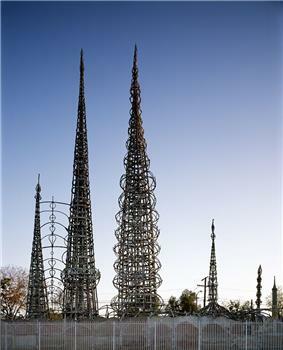 Both are within L.A. city limits, approximately 10 miles (16 km) apart. 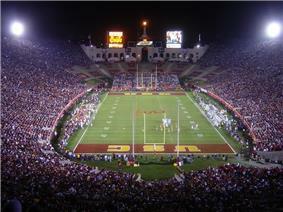 Until 1982 the two schools also shared the same football stadium, the Los Angeles Memorial Coliseum. The victor of the annual football game takes home the Victory Bell. The Trojans and Bruins also compete in a year-long all-sports competition for the Lexus Gauntlet Trophy. Pranks between UCLA and USC were commonplace several decades ago. Both universities have cracked down on pranks since a 1989 incident when USC students released hundreds of crickets into the main UCLA library during finals week. Days before a clash between rivals UCLA and USC in 2009, the Bruins mascot was vandalized. It was splashed in cardinal and gold paint, USC's official colors sparking memories of pranks played in the years earlier. The week preceding the annual football matchup with UCLA is known as "Troy Week" and features a number of traditions including CONQUEST! 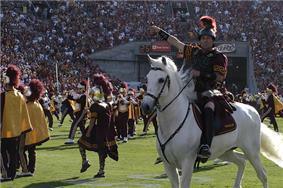 "The Ultimate Trojan Experience", Save Tommy Night, the CONQUEST! Bonfire, and all-night vigils by the Trojan Knights to protect the campus from UCLA Bruins. USC has rivalries with multiple schools. Though generally limited to football, USC has a major rivalry with Notre Dame. The annual game is played for the Jeweled Shillelagh. The rivalry has featured more national championship teams, Heisman trophy winners, All-Americans, and future NFL hall-of-famers than any other collegiate match-up. The two schools have kept the annual game on their schedules since 1926 (except 1942–44 because of World War II travel restrictions) and the game is often referred to as the greatest intersectional rivalry in college football. The Women of Troy have won 7 championships in tennis, 6 in volleyball, 3 in water polo, 2 in golf, 2 in basketball, 1 in swimming and diving, 1 in track and field, and 1 in soccer. Women's teams have earned 23 national championships. The Women of Troy have brought home 64 individual NCAA crowns. Two Women of Troy athletes have won the Honda-Broderick Cup as the top collegiate woman athlete of the year: Cheryl Miller (1983–84) and Angela Williams (2001–02). And Trojan women have won 8 Honda Awards, as the top female athlete in their sport. The USC football program has historically ranked among the best in the Division I FBS. The Trojans football team has won 11 national championships. Seven players have won the Heisman Trophy, although the school claims six, after alleged violations involving Reggie Bush. As of 2011, 472 Trojans have been taken in the NFL draft, more than any other university. In men's sports, USC has won 93 team national championships (80 NCAA titles) - more than any other school - and male athletes have won a record 303 individual NCAA titles. The Trojans have won 26 championships in track and field, 20 in tennis, 12 in baseball, 9 in swimming and diving, 7 in water polo, 6 in volleyball, 2 in indoor track and field, and 1 in gymnastics. [c] USC's men's basketball has appeared in the NCAA tournament 15 times, and made 2 NCAA Final Four appearances. From the 1904 Summer Olympics through the 2008 games, 393 Trojan athletes have competed in the Games, taking home 122 gold medals, 76 silver and 60 bronze. If it were an independent country, USC would be ranked 14th in the world in terms of medals. Since 1912, USC is the only university in the world to have a gold medal-winning athlete in every summer Olympiad. USC has won 100 NCAA team championships, 3rd behind cross-town rival UCLA (111) and Stanford (105). The Trojans have also won at least one national team title in 26 consecutive years (1959–60 to 1984–85). USC won the National College All-Sports Championship, an annual ranking by USA Today of the country's top athletic programs, 6 times since its inception in 1971. Four Trojans have won the James E. Sullivan Award as the top amateur athlete in America: diver Sammy Lee (1953), shot putter Parry O'Brien (1959), swimmer John Naber (1977) and swimmer Janet Evans (1989). 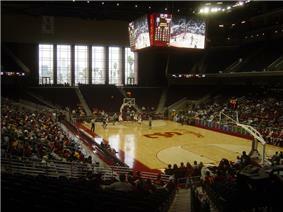 The USC Trojans participate in Texas Longhorns. USC's cross-town rival is the University of California, Los Angeles (UCLA), with whom there is fierce athletic and scholastic competition. USC's rivalry with University of Notre Dame—though generally limited to football—predates the UCLA rivalry by three years. The Notre Dame rivalry stems mainly from the annual football game played between these two universities and is considered one of the greatest rivalries in college athletics. There are currently more than 340,000 Star Wars trilogy; Hollywood screen legend John Wayne (who also played in the USC football team); acclaimed actor and comedian Will Ferrell; world-renowned architect Frank Gehry; longtime Los Angeles Lakers owner Jerry Buss; recycling symbol designer Gary Anderson; and deposed Egyptian president Mohamed Morsi, the first democratically-elected president in that country's history. Notable USC faculty include or have included the following: Simon Ramo, Irving Reed, Michael Waterman, Frank Gehry, Arieh Warshel, Lloyd Welch, Jonathan Taplin and Diane Winston. The university has two Jonathan Postel was an editor of communications-protocol for the fledgling internet, also known as ARPANET. 2012-2013 Undergraduate Estimate of Costs at USC: Tuition - $43,722; Mandatory fees - $741; Room and board* - 12,440; Books and supplies - $1,500; Personal and miscellaneous - $900; Transportation - $580.00. Total - $59,883 + $150 USC Orientation fee for the 1st semester. 37,210 students applied for admission to the undergraduate class of 2015, with 8,566 being admitted (23%) and 2,931 enrolling (34% yield). Among admitted students, the interquartile range for SAT composite scores was 2020-2240 and the average unweighted GPA was 3.80, while among enrolled freshmen, the SAT range was 1970-2180 and the average GPA was 3.72. 20 percent of admitted and attending students are SCions, or students with familial ties to USC, while 14 percent are the first generation in their family to attend any form of college. There were also 247 National Merit Scholar winners and 7 National Achievement Scholars in the admitted class. USC ranks among the top five schools in the nation in terms of its enrollment of National Merit Scholars. USC's admission rate has dropped to 20% for the class of 2016, following its adoption of the Common Application. USC has a total enrollment of 36,896 students, of which 17,380 are at the undergraduate and 19,516 at the graduate and professional levels. The male-female ratio at USC is nearly 1:1. 31.2% of incoming students are drawn from the greater Los Angeles metropolitan area, 20.9% from other areas in California, 39.5% from the rest of the United States, and 8.4% from abroad. USC's student body encompasses 7,115 international students, more than any other university in the United States and the university maintains offices in several countries. [b] There are approximately 200,000 living Trojan Alumni. The Institute of Higher Education at Shanghai Jiao Tong University ranked USC's combined departments of engineering and computer sciences as 11th in the world, physical sciences 52nd, social sciences 35th, life sciences 51st, clinical medicine and pharmacy 47th. The Princeton Review ranked USC video game design program as 1st out of 150 schools in North America. The university's video game design programs are interdisciplinary, involving the Interactive Media & Games Division of the USC School of Cinematic Arts and the CS Games program in the Department of Computer Science at the USC Viterbi School of Engineering. USC was named "College of the Year 2000" by the editors of Time and The Princeton Review for the university's extensive community-service programs. 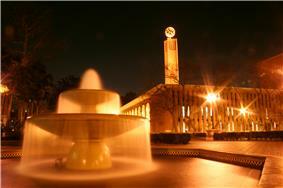 USC was ranked 23rd in U.S. News & World Report's 2013 annual ranking of national universities. In the Times Higher Education World University Rankings, USC ranked between 61-70 for 2014. USC is ranked 46th among world universities and 32nd among universities in the Americas by the Academic Ranking of World Universities, 48th worldwide in 2011 by Human Resources & Labor Review, and 13th (tied with seven other universities) among national universities by The Center for Measuring University Performance. USC's 22 libraries and other archives currently hold nearly 4 million printed volumes, 6 million items in microform, and 3 million photographs and subscribe to more than 30,000 current serial titles, nearly 44,000 feet (13,000 m) of manuscripts and archives, and subscribe to over 120 electronic databases and more than 14,000 journals in print and electronic formats. Annually, reference transactions number close to 50,000 and approximately 1,100 instructional presentations are made to 16,000 participants. 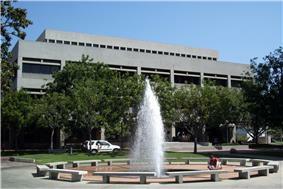 The University of Southern California Library system is among the top 35 largest university library systems in the United States. In October 2010, the collections at ONE National Gay & Lesbian Archives, the largest repository for Lesbian, Gay, Bisexual and Transgender (LGBT) in the world, became a part of the USC Libraries system. The collections at ONE include over two million archival items documenting LGBT history including periodicals; books; film, video and audio recordings; photographs; artworks; ephemera, such clothing, costumes, and buttons; organizational records; and personal paper. The first true library was housed in the College of Liberal Arts Building ("Old College"), which was built in 1884, and designed to hold the entire USC student body—55 students. Two wings were added to the original building in 1905. In 2012, USC established the Glorya Kaufman School of Dance, the university's first new school in 40 years, which was a gift from philanthropist Glorya Kaufman. The USC Kaufman School currently offers individual classes in technique, performance, choreography, production, theory and history that are open to all students at USC. Beginning in the fall of 2015, the USC Glorya Kaufman School of Dance will offer a Bachelor of Fine Arts degree to a select number of undergraduates who wish to pursue dance as their major. This four-year professional degree will be housed in the state-of-the-art Glorya Kaufman International Dance Center, which is now under construction. In May 2006, USC's Board of Trustees and administration traveled to China. to announce the establishment of the USC U.S.-China Institute (USCI). USCI focuses on the multidimensional and evolving U.S–China relationship and trends in China. USCI has funded research into a variety of topics including the history of U.S.–China diplomatic exchanges, aging, property rights, environmental challenges, agricultural policy, new media, migration, and technology exchange. The Institute produced the highly regarded Assignment:China documentary series on American media coverage of China from the 1940s to today. It also publishes two magazines, US-China Today and Asia Pacific Arts. USC collaborated with Shanghai Jiao Tong University to offer the USC (Executive) EMBA program in Shanghai. 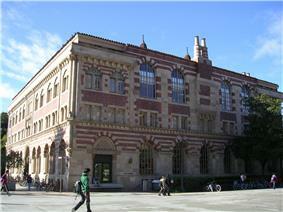 USC also operates two international study centers in Paris and Madrid. The Marshall School of Business has satellite campuses in Orange County and San Diego. 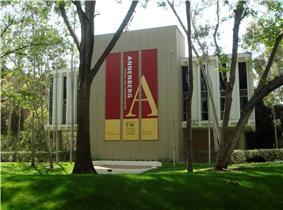 The Annenberg School for Communication & Journalism, founded in 1971 is one of the two communication programs in the country endowed by Walter Annenberg (the other is at the University of Pennsylvania). The School of Journalism, which became part of the School for Communication in 1994, features a core curriculum that requires students to devote themselves equally to print, broadcast and online media for the first year of study. The journalism school consistently ranks among the nation's top undergraduate journalism schools. USC's Annenberg School for Communication endowment rose from $7.5 million to $218 million between 1996 and 2007. The Andrew and Erna Viterbi School of Engineering is headed by Dean Yannis Yortsos. Previously known as the USC School of Engineering, it was renamed on March 2, 2004, as the Andrew and Erna Viterbi School of Engineering in honor of Qualcomm co-founder Andrew Viterbi and his wife Erna, who had donated $52 million to the school. 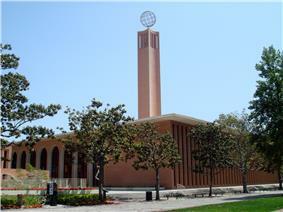 Viterbi school of Engineering is ranked No.9 in the US as per the US News Rankings for engineering in 2013-14. The Richard Neutra, Ralph Knowles, James Steele, A. Quincy Jones, William Pereira and Pierre Koenig. The school of architecture also claims notable alumni Frank Gehry, Jon Jerde, Thom Mayne, Raphael Soriano, Gregory Ain, and Pierre Koenig. Two of the alumni have become Pritzker Prize winners. In 2006, Qingyun Ma, a distinguished Shanghai-based architect, was named dean of the school. 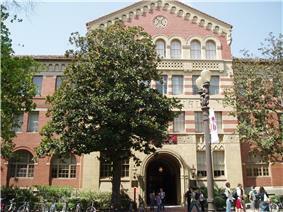 The USC Dana and David Dornsife College of Letters, Arts, and Sciences, the oldest and largest of the USC schools, grants undergraduate degrees in more than 130 majors and minors across the humanities, social sciences, and natural/physical sciences, and offers doctoral and masters programs in more than 20 fields. Dornsife College is responsible for the general education program for all USC undergraduates, and houses a full-time faculty of approximately 700, more than 6500 undergraduate majors (roughly half the total USC undergraduate population), and 1200 doctoral students. In addition to 30 academic departments, the College also houses dozens of research centers and institutes. In the 2008–2009 academic year, 4,400 undergraduate degrees and 5,500 advanced degrees were awarded. Formerly called "USC College of Letters, Arts & Sciences", the College received a $200 million gift from USC trustees Dana and David Dornsife on March 23, 2011, after which the College was renamed in their honor, following the naming pattern of other professional schools and departments at the University. All Ph.D. degrees awarded at USC and most masters degrees are under the jurisdiction of the Graduate School. Professional degrees are awarded by each of the respective professional schools. Through a Memorandum of Understanding (MOU) with the LAPD, the DPS Officers have limited arrest authority on and around the USC campuses. The primary responsibility of DPS is the protection of the University community. The statutory authority for the existence of the USC Department of Public Safety, patrol and response boundaries, authority to carry firearms, and powers of arrest are derived from the MOU, the California Penal and Educational Codes, and the Bureau of Investigation and Security Services section of the California Business and Profession Code. The MOU with LAPD allows the DPS Officers to exercise arrest powers described in Penal Code Section 830.7(b). All arrests must be conducted in accordance with guidelines outlined by the MOU, and all arrestees without unnecessary delay, must be delivered to LAPD. DPS employs part-time student workers in its Trojan Student Officer Program. They are responsible for promoting bicycle safety, enforcing campus bicycle regulations, and deterring bicycle theft. They also supplement bookstore security, perform administrative duties, and offer an added security presence by patrolling parking lots and university residential complexes. The Department’s 24-hour communications center coordinates and supports the activities of field personnel. Nineteen Public Safety Communication Operators coordinate communication among the campus community and the officers who are providing services in the field. The communications center also provides dispatch services for USC’s Transportation Services and monitors several other radio frequencies, including the LAPD officers assigned to the area. DPS also has 151 un-armed Community Service Officers (CSOs) who complement the services provided by the Public Safety Officers. There are a total of 115 armed officers who provide services to the two campuses. The Department’s Public Safety Officers (PSOs) are police academy graduates who must pass an extensive screening process and background check before they are hired. The Department enjoys an excellent working relationship with the Los Angeles Police Department (LAPD). A special joint USC/LAPD crime task force composed of USC DPS personnel and approximately 40 selected Los Angeles police officers is assigned exclusively to the USC campus community to address crime and quality of life issues. The University Park Task Force (UPTF) utilizes crime-related intelligence and data and crime analysis to more effectively deal with crime impacting the USC Community. USC’s Department of Public Safety (DPS) is one of the largest university law enforcement agencies in the nation. The Department of Public Safety headquarters is located on the University Park campus, and there is a substation on the Health Sciences campus. The department operates 24 hours a day, 365 days a year. The authorized strength of the department is 293 full-time members. The Undergraduate Student Government (USG) makes decisions representing the undergraduate students of the university. It consists of an appointed executive leadership board, popularly elected legislative branch, and judicial oversight, along with a programming board (commonly referred to as "Program Board"). All USG activities are funded by the student activity fee, which the Treasurer has control over setting and that the Senate approves. In addition to USG, residents within university housing are represented and governed by the University Residential Student Community (URSC), which is divided by residence hall. The Graduate Student Government (GSG) consists of senators elected by the students of each school proportional to its enrollment and its activities are funded by a graduate and professional student activity fee. The University of Southern California's 17 professional schools include the USC Leventhal School of Accounting, USC School of Architecture, USC Marshall School of Business, USC School of Cinematic Arts, USC Annenberg School for Communication and Journalism, Herman Ostrow School of Dentistry of USC, USC Rossier School of Education, USC Viterbi School of Engineering, USC Roski School of Fine Arts and Design, USC Davis School of Gerontology, USC Gould School of Law, Keck School of Medicine of USC, USC Thornton School of Music, USC School of Pharmacy, USC Price School of Public Policy, USC School of Social Work, and USC School of Theatre. The USC Dana and David Dornsife College of Letters, Arts, and Sciences, the Graduate School, and the 17 professional schools are each led by an academic dean. USC occasionally awards emeritus titles to former administrators. There are currently six administrators emeriti. The university administration consists of a president, a provost, several vice-presidents of various departments, a treasurer, a chief information officer, and an athletic director. The current president is C. L. Max Nikias. In 2008, Nikias' predecessor, Steven Sample, was one of the highest paid university presidents in the United States with a salary of $1.9 million. Chaffey College was founded in 1883 in the city of Ontario, California, as an agricultural college branch campus of USC under the name of Chaffey College of Agriculture of the University of Southern California. 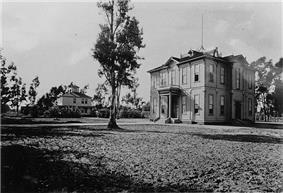 USC ran the Chaffey College of Agriculture until financial troubles closed the school in 1901. 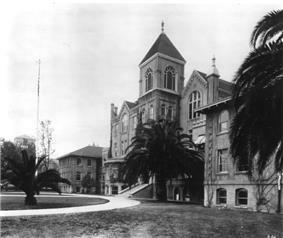 In 1906, the school was reopened by municipal and regional government and officially separated from USC. Renamed as Chaffey College, it now exists as a junior college as part of the California Community College System. 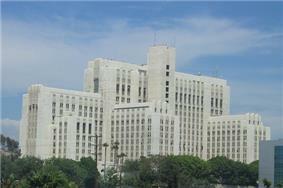 In addition to the Los Angeles County-USC Medical Center, which is one of the nation's largest teaching hospitals, the campus includes three patient care facilities: USC Norris Comprehensive Cancer Center, USC University Hospital, and the USC Eye Institute. USC faculty staffs these and many other hospitals in Southern California, including the internationally acclaimed Children's Hospital Los Angeles. The health sciences campus is also home to several research buildings such as USC/Norris Cancer Research Tower, Institute for Genetic Medicine, Zilkha Neurogenetic Institute, Harlyne J. Norris Cancer Research Tower and Eli and Edythe Broad Center for Regenerative Medicine and Stem Cell Research. Located three miles (5 km) from downtown Los Angeles and seven miles (11 km) from the transplantation biology, among others. The 50-acre (20 ha) campus is home to the region's first and oldest medical and pharmacy schools, as well as acclaimed programs in physical therapy and occupational therapy (which are both ranked #1 by U.S. News & World Report). As well, USC physicians serve more than one million patients each year. Metro Expo Line light-rail service from Downtown Los Angeles began in 2012. The line currently runs to Culver City and will be extended to Santa Monica in 2015. The Expo Line has three stations in the vicinity of the USC main campus: Jefferson/USC Station, Expo Park/USC Station, and Vermont/Expo Station. In addition, the USC main campus is served by several Metro bus routes as well as LADOT DASH Route F.
USC has an endowment of $3.7 billion and also is allocated $430 million per year in sponsored research. USC became the only university to receive eight separate nine-figure gifts: $120 million from Ambassador USC School of Cinema-Television, now renamed USC School of Cinematic Arts, $200 million from Dana and David Dornsife for USC's College of Letters, Arts and Sciences to support undergraduate and Ph.D. programs and $110 million from John and Julie Mork for undergraduate scholarships. Besides its main campus at University Park, USC also operates the Health Sciences Campus about 2 miles (3.2 km) northeast of downtown. In addition, the Children's Hospital Los Angeles is staffed by USC faculty from the Keck School of Medicine and is often referred to as USC's third campus. USC also operates an Orange County center in Irvine for business, pharmacy, social work and education; and the Information Sciences Institute, with centers in Arlington, Virginia and Marina del Rey. For its science students, USC operates the Wrigley Institute for Environmental Studies located on Catalina Island just 20 miles (32 km) off the coast of Los Angeles and home to the Philip K. Wrigley Marine Science Center. The University Park campus is in the University Park district of Los Angeles, 2 miles (3.2 km) southwest of Downtown Los Angeles. The campus's boundaries are Jefferson Boulevard on the north and northeast, Figueroa Street on the southeast, Exposition Boulevard on the south, and Vermont Avenue on the west. Since the 1960s, through campus vehicle traffic has been either severely restricted or entirely prohibited on some thoroughfares. The University Park campus is within walking distance to Los Angeles landmarks such as the Shrine Auditorium, Staples Center, and Los Angeles Coliseum. Most buildings are in the Romanesque Revival style, although some dormitories, engineering buildings, and physical sciences labs are of various Modernist styles (especially two large Brutalist dormitories at the campus's northern edge) that sharply contrast with the predominantly red-brick campus. Widney Alumni House, built in 1880, is the oldest university building in Southern California. In recent years the campus has been renovated to remove the vestiges of old roads and replace them with traditional university quads and gardens. On May 1, 2014, USC was named as one of many higher education institutions under investigation by the Office of Civil Rights for potential Title IX violations by Barack Obama's White House Task Force to Protect Students from Sexual Assault. USC is responsible for $4 billion in economic output in Los Angeles County; USC students spend $406 million yearly in the local economy and visitors to the campus add another $12.3 million. 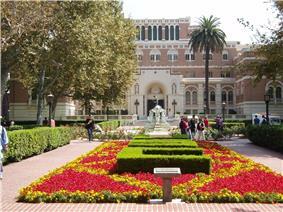 USC students and athletes are known as Trojans, epitomized by the George F. Bovard, approved the name officially.